Ever wonder how that perfect double row of stitching at the bottom of t-shirts is achieved? Well….it’s probably done with some automated industrial machine. But you can achieve that look yourself with just one special tool……a twin needle! I was a little bit intimidated to try sewing with a twin needle but with a grand total investment of $3.49, I figured it was worth giving it a go. The first time I tried it out was on the hem for the Vogue shirt in my last post and, uh-oh folks, I’m addicted! 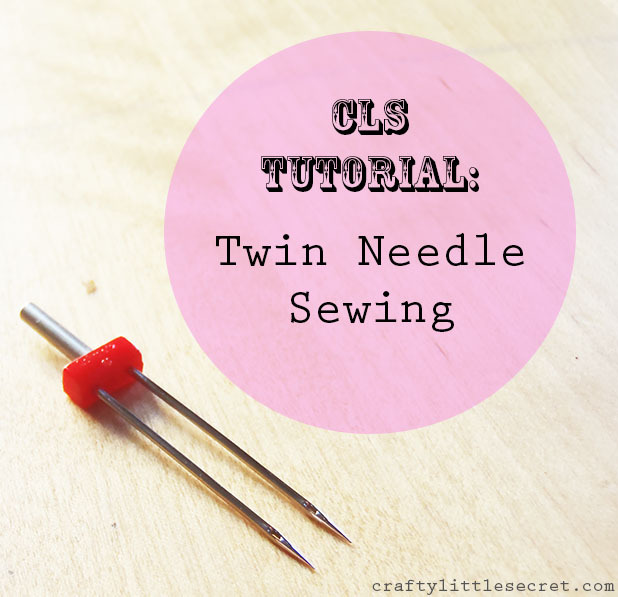 Twin needles can fit pretty much any machine and are threaded up exactly how you’d thread a single needle. Some machines actually have a second spool holder and I suspect that fancy machines with tons of embroidery and decorative stitch options are designed to accommodate them. My machine is neither of these things. 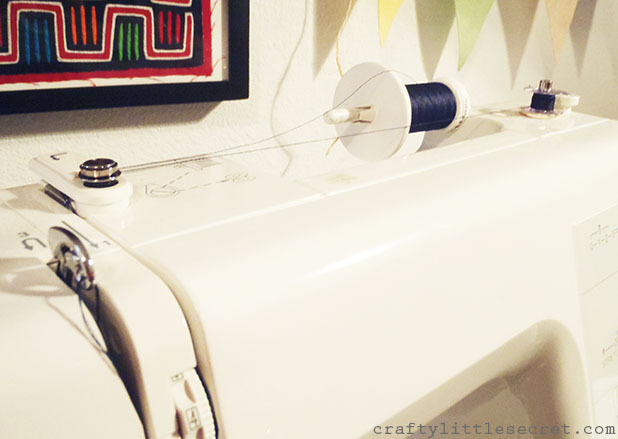 If, like me, your machine isn’t setup with two spool holders, just make a bobbin and thread your machine from the spool holder and the bobbin holder. 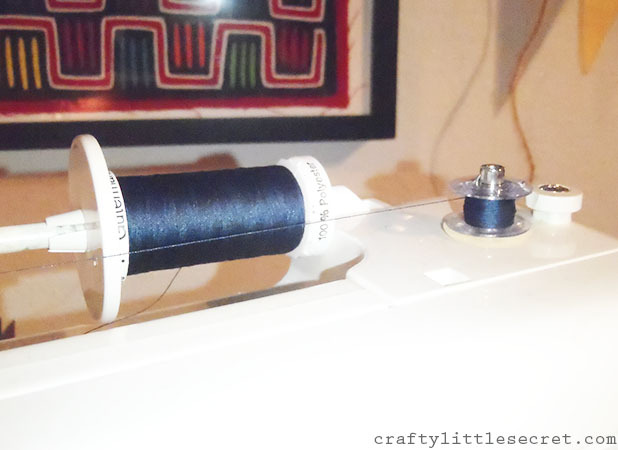 Run the thread from your main spool and your bobbin together, exactly the same as you would for a single needle just with two threads instead of one! It’s a little hard to see the two threads here, but if you look at the red at the top of the needle, you can see the two threads coming through the machine together then diverging and each threading a separate needle. Separate the threads when you get to the needle and thread each needle with a single thread. The bobbin will pick up both threads, just sew as you normally would!! And just that simply, friends, you too can have a pro-looking hem on your garments! Look at those two perfectly parallel stitched lines! Ooooooh! Aaaaaaaah! But as I said at the beginning, I’m addicted! So of course I didn’t stop with a hem. 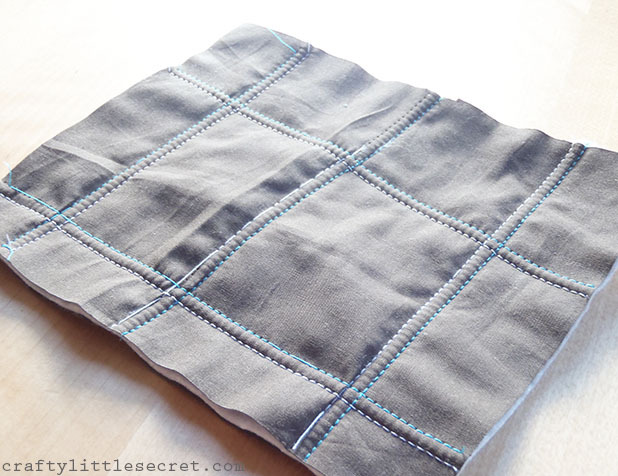 I played around with different thread colors and made a little quilt sampler. How cute would this quilting be on a pillow sham? One little side note here. See the white thread in the middle row of stitches? How it breaks off and skips stitches all over the place? Yeah. That’s what happens when you use really cheap thread, so buy nice thread people! I also found with my machine, maybe because it’s not meant for the twin needle, that it would occasionally skip stitches when I sewed too quickly (that’s what happened to the blue stitches in the foreground). 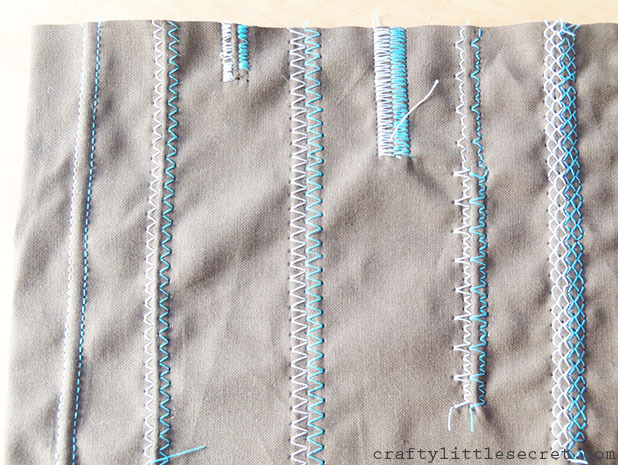 Slow and steady wins the race folks…..or at least sews the neater line. The straight stitches looked so cute I was inspired to play around with all my machine’s decorative stitch options (which are pretty limited, I have a very basic machine) and sewed up a sampler. 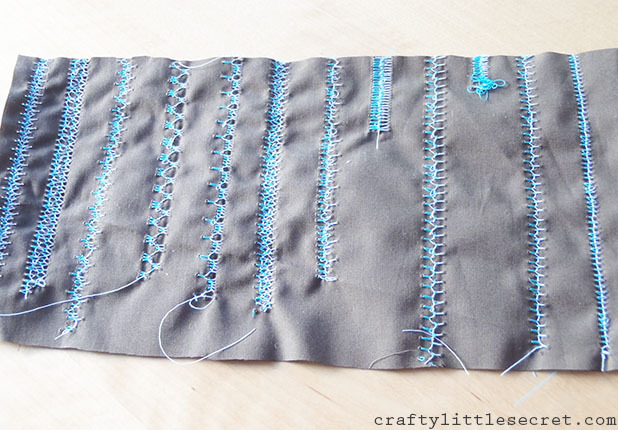 You can play around with stitch widths and lengths to get the pattern and spacing you want! 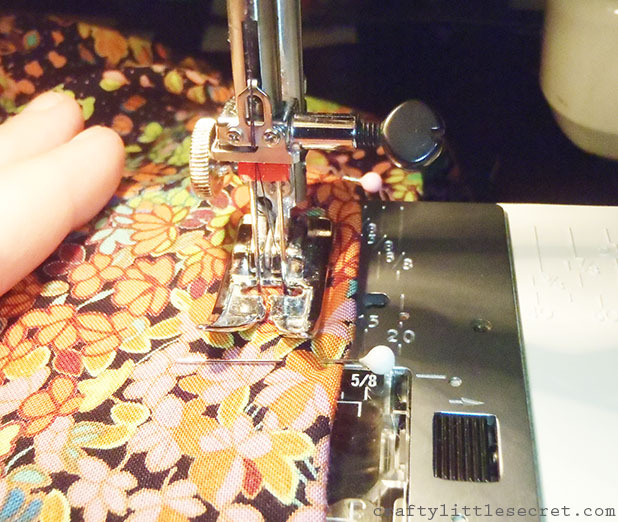 One thing I want to point out here is to watch your width when sewing with a twin needle. 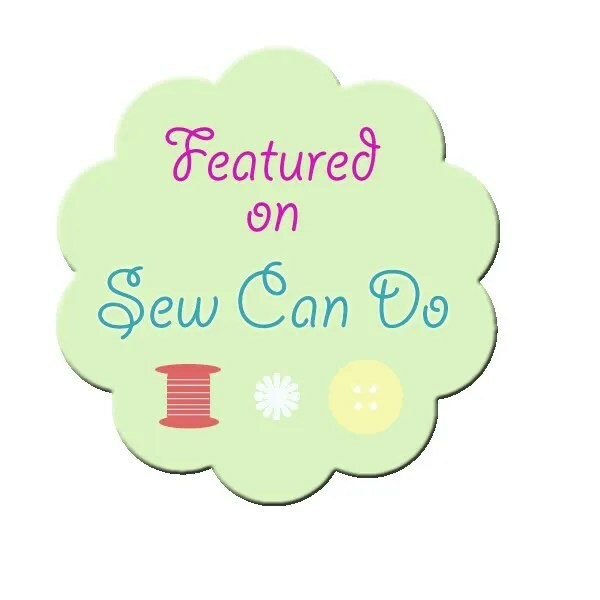 Your machine’s width settings are designed for a single needle, if you’re using a double you won’t be able to stitch as wide as when you use a single. For instance, my machine normally goes to a width of 6.5, but with the twin needle the highest I could go on the zigzag stitches was 5. The twin needles also come in different widths; 2, 4 or 6. The numbers correspond to how far apart the needles are from each other. Keep in mind when choosing needles that the widest needle size you can choose corresponds to the widest width setting on your machine. Since my machine goes up to 6.5 I can go up to a 6 in the twin needles, but if your machine doesn’t go up to a width of 6 you’d better stick with a 4 in the twin needles. Also bear in mind that the more separation you go with in your twin needles, the less you’ll be able to play with zigzag and decorative stitches. 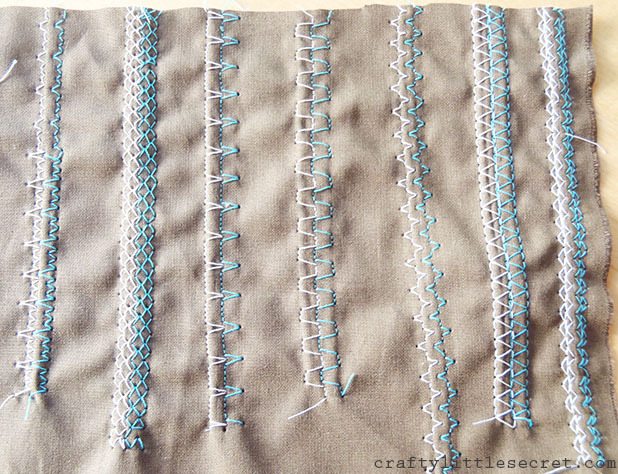 The needles need space to go side-to-side with a zigzag stitch so if you max out on your needle size, you won’t have any space left to move side-to-side. And lastly, the backside. This is the one place where the twin needle is a little less than spectacular on my machine. Try as I might, I could not find a tension adjustment that made a nice neat back. Maybe this is as good as it gets for everyone? I dunno. I read that sometimes making a minor adjustment to the bobbin tension can help a lot but I’m not about to starting messing around with that. Especially on my old machine that hasn’t been tuned up in….oh…..ever. So there you have it. Twin needle sewing. Try it! You’ll like it. 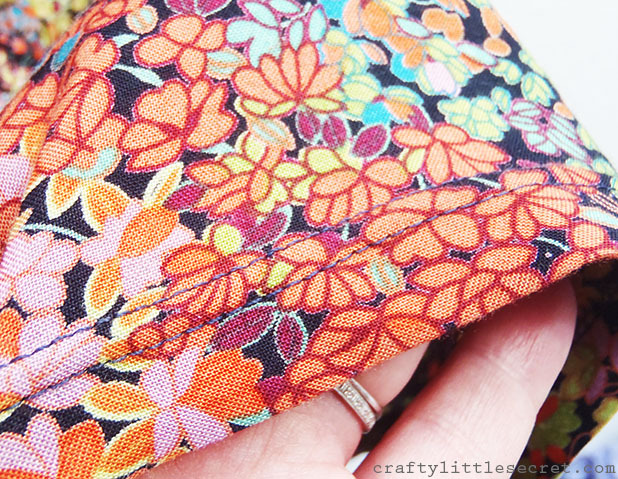 This entry was posted in Patterns and Tutorials on March 21, 2014 by missphd.